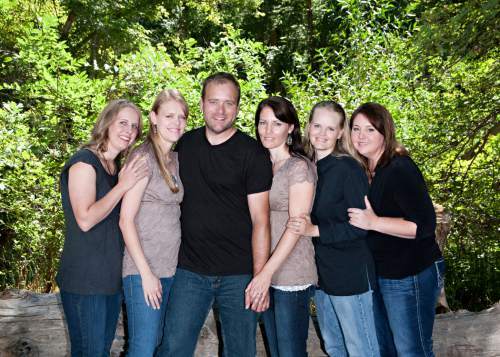 | Courtesy Brady Williams and his wives, from left to right: Nonie, Robyn, Brady, Paulie, Rhonda, Rosemary. Utah&apos;s most-public polygamous group, the Apostolic United Brethren, says it is investigating claims its leader molested his daughter years ago. Rosemary Williams of "My Five Wives" on TLC, in a blog post last month said her father, Lynn A. Thompson, fondled her in Montana when she was 12 years old. Williams&apos; post also relayed accusations from other women who said Thompson molested them. The AUB issued a press release Tuesday outlining the steps the group takes to prevent sexual and domestic abuse in its ranks, including mandatory reporting by church leaders and participating in programs with anti-violence groups. In an interview, AUB spokesman David Watson, said other leaders in the church are investigating the allegation against Thompson. Watson said he was not aware law enforcement had contacted the AUB. "If there&apos;s criminal allegations that need to be turned over to local authorities, that&apos;s what we do," Watson said. Williams&apos; husband, Brady Williams, said in an interview Tuesday that an AUB apostle asked her for an affidavit before she went public with her allegations, but no one else from the church or law enforcement has contacted her since. "No one will reach out to Rosemary from the family or the [AUB]," he said. Brady Williams said he wants the same thing Rosemary wants  for Thompson to leave or be removed from his position of power. "The members of the AUB need to open their eyes and realize the man who sits on the mantle of power and what type of person he is and whether that&apos;s a man you really want to follow," Brady Williams said. Thompson denied the allegations when contacted by the Associated Press, the news service reported last month. Unified Police Department Lt. Justin Hoyal on Tuesday said detectives there were not investigating any complaints against Thompson. Utah Attorney General&apos;s Office spokeswoman Missy Larsen said, citing an office policy against acknowledging investigations, declined to say whether detectives there are investigating Thompson. The AUB is thought to have about 7,500 followers across Utah and the western United States. The church&apos;s followers include the Brown family from the television show "Sister Wives." The Browns last year won a lawsuit striking the portion of Utah&apos;s bigamy law that targeted polygamists. The state of Utah is appealing. Thompson became leader of the AUB earlier in September when J. LaMoine Jenson died. The Williams family left the AUB years ago over what Brady Williams called differences over "intolerant doctrines" opposing homosexuality and "promoting misogyny."